Here's a time saving tip that hits close to home. I struggle everyday with letting my family get drinks for themselves. I am weaning myself off of getting drinks for kids every time they ask for one. The hardest part? Teaching them to use the same cup all... day... long. Who knew it would be so hard? How can something so simple be so difficult? I many never know the answer. Check out Real Simple for more time saving tips! What I do know? This is a brilliant and time saving idea. 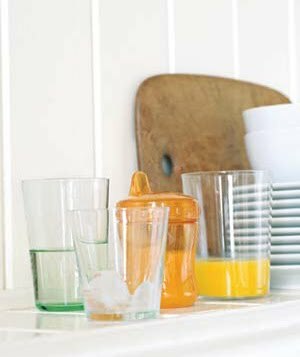 If kids (and spouse) know where to put a cup that can be used again, hopefully it will save time in less dish washing!! I love it. Where do you keep cups that should be used again?